The very earliest navigation aids were open fires fueled by wood on hill tops that served as beacons. When towers were eventually built, the fires were placed on top of the structures. Because wood burned quickly and needed constant stoking, coal became in use because it burned more slowly and needed less monitoring. But, when enclosed behind glass or reflectors, the soot build up became a serious maintenance problem. A later development was a lamp consisting of a pan of oil with four wicks extended. These were called “Spider lamps”which were introduced first in Boston in 1790, and were used by most lighthouses until 1812. Winslow Lewis held center stage in the history of lighthouses for a period of forty years in the United States. In 1805, the 35-year-old captain operated ships between Boston and Liverpool, England. This enterprise came to a halt when an embargo was established against the English, in 1807. This resulted in Lewis’s venture into experimenting with new modes of beaconing. In 1810, he patented his “reflecting and magnifying lantern” which became known as the Lewis Lens. It was manufactured using a slightly green molded glass that was 9-inches in diameter. The round lens was seated in a copper rim and placed in front of the lamp, thus, both reflecting and magnifying the light beam. By the end of 1812, forty of the forty-nine U.S. lighthouses in existence were converted to the Lewis Lens – the nine remaining lights were also converted in 1815, when the War of 1812 had ended. In 1816, Lewis had contracted with the United States to supply oil for all the lighthouses and to provide an annual inspection tour personally to each light station – and to render a report on the condition of each. He lost this contract to competition in 1827, and then directed his attention to building light towers. His first construction was the Frank’s Island light station at the northeast Pass of the Mississippi River. In 1819, the design of the tower was by Benjamin Latrobe, designer of the United States Capitol and recognized as the father of American architecture. The contract was for $79,000, but because Lewis didn’t have faith in the design, he accepted the contract with a stipulation that he had to be paid regardless, even if the tower toppled during construction. Winston Lewis had publicly stated that the site foundation would not hold the weight of the planned lighthouse as designed by Latrobe. Coincidentally, just 8 days before completion of the tower – the foundation failed. Thus, fully paid, in 1822, Lewis submitted a set of plans of his own and re-erected the fallen tower for just $9,750. After which, Winston Lewis became the principle builder of light towers in the United States that numbered eighty in all. Confident of his structures, he designed five sets of plans, each varying only by height. Unfortunately, Lewis’s monopoly hold prevented the introduction of the French Fresnel Lens which was a major innovation in Europe as early as 1830. French physicist Augustin-Jean Fresnel (pronounced Fray-nel) revolutionized the light emitting system from lighthouses. The Fresnel lens combined the characteristics of the two former techniques, causing a central reflecting bull’s eye to emerge as a single concentrated beam shaft for light that traveled in one direction. His technique involved a series of concentric prismatic rings and refracting prisms. It was so well designed, that the Fresnel lens essentially has remained unchanged even today. When the Fresnel lens first came into operation the large heavy lenses rested on wheels or on ball bearings in a track that were positioned at the base of the lenses. The light beam moved slowly as the turning lens caused the viewer of the light to see a flash with periods of dark between. The first lens apparatus were operated by a clock work mechanism much like a grandfather clock with chains, pulleys, and weights. Due to the extremely exposed locations of most lighthouses and the high cost of construction and maintenance, Lighthouse Engineers considered durability first when designing towers. 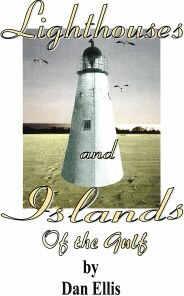 The first lighthouses on the Gulf Coast were copies of New England brick towers that had proven most durable. In fact, much of the brick used on the Gulf was shipped from New England, despite the availability of local high-quality clay. Even with the first towers built, the Lighthouse service found that the massive weight of a brick tower was too much for the softer soil on the Gulf Coast. Of the 40 or more brick lighthouses constructed, at least 25 sank into the bottom or blew down from storms, because they did not have solid footing. By the 1840s, the service saw some advantage in frame houses with lanterns mounted on top. The keeper had to have quarters regardless, so the frame dwellings could be moved about almost at will to escape the ruinous effects of erosion. Many of these true “light/houses” burned down or were blown down by hurricanes – but only a few were destroyed due to foundation inadequacy. Eventually iron screwpiles were introduced. These were turned into the ground rather than pounded, as were wood pilings, therefore offering a more stable, light-weight base. Rust was less a problem than Teredos (wood boring worms). Screwpiles appeared along the Gulf Coast just prior to the Civil War. Some were constructed of cheap, replaceable frame structures of a modified Chesapeake Bay style, – while others were tall iron skeleton towers with low wind resistance and made of lightweight material..
Of those architectural forms of construction that were deemed successful for the Gulf Coast, it is the iron screwpile. But apparently more important than the style of construction is the location of the lighthouse — the better sites are those not prone to uncontrollable erosion. Lighthouse sites that were selected by geologists capable of predicting accurate erosion factors – or at those sites that offered some protection from hurricanes – were the ones that lasted the longest. The iron-clad Biloxi Lighthouse has stood since 1848 – and the brick Pass Christian Lighthouse, also constructed atop a ridge on the mainland endured from 1831, until dismantled in the 1890s, are prime examples. The First U.S. Congress on August 7, 1789 passed as its 12th legislative Act, a federal lighthouse program taking control and supervision of eleven existing colonial lights. By 1800, the United States had grown to have 16 lights; by 1842, there were 256. Eventually, there were 1,200 to 1,300 lights which were constructed mostly during the 19th century. The American government had finally come to realize the benefits of lighthouses, both for defense and for commerce. The first Gulf Coast Light towers were designed in similar structure as those of the New England lights seen today. It took many years to pass before Lighthouse engineers changed from the heavy brick designs that eventually leaned and toppled over when their foundations were washed away by hurricanes and water turbulence. These had been heavily influenced by Winslow Lewis and the Lighthouse Auditor. With the opening up of the Midwest territories, a significant commercial boom took place. Land sales in the central Mississippi River basin reached $25 million in 1835. In 1837, Chicago was organized as a city. During that same period, in the early 1830s, the small ports of the Gulf Coast were shipping as much cotton as the entire state of South Carolina. Within 30 years, cotton accounted for 57 percent of all U.S. exports – virtually all of it being shipped out of the Gulf. Thus, it was that the cotton trade became one of the major issues that spurred lighthouse construction in the 1830s. Steam-powered river-boats and ocean-going vessels begin to be increasingly common. The rivers became the interstate highways of the first half of the 19th century. The U.S. government began spending less on canal construction and toll roads and shifted priorities to spend more money on aids to navigation, especially lighthouses. The introduction of perfected steam dredging permitted the Corps of Engineers to deepen the Gulf’s channels and shallow port harbors. Without the lighting of the Gulf coast, night navigation was very hazardous. In the 1820s, U.S. Congressman Johnston of Louisiana had requested the government to inquire into the expediency of erecting a lighthouse, and placing buoys at or near the south-west pass of the Mississippi River. He also raised the question of benefits for erecting lights and buoys, at or near, the passes of Christian and Marianne, in addition to sites on the Island of St. Joseph and on Round Island; and a floating light at Cat Island. Simultaneously, Congressman Ellis of Mississippi presented to Congress the request by the Mississippi State Legislature for the erection of lighthouses at the Rigolets, St. Joseph’s Island, Pass Christian, and Pascagoula Bay. By the 1850s, technology had a direct impact on lighthouse construction when the new screwpile was introduced to the Gulf. For the first time, the erection of lightweight structures (compared to mortar and brick) was allowed in shallow, slow-moving waters, in addition to being placed on mud, sand, or shell bottoms. It became a goal to place a light every 50 miles along the coast. In 1852, the U.S. Light-House Board was established. Even prior to this, the South had already become dependant on lighthouses – there was no railroad network as yet. Lighthouses were critical to navigation due to the winding channels and shallow bays along the Sound — and more so because of the many sand bars that lined the mouths of rivers and bay entrances.